Located just north of the historic village of Ploerdut, This secluded and tranquil setting with its own woodland and lake offers peaceful living in harmony with nature. This property is back on the market, the owners of this property had a purchaser who asked that various anomalies of the property that came up on the electric diagnostics were fixed before they would sign the compromis and agree to go ahead with the sale, the owners agreed to have the work required done and the prospective purchasers seemed satisfied and then they were not satisfied with the fosse report and wanted a more updated report done, which was carried out and now 6 months down the line, the purchasers have now pulled out and not going ahead with the sale. This has obviously been frustrating and sole destroying for the owners who kindly agreed to have done what they requested but with no sale! and 6 months of their property being off the market! The main house stands in a large south facing courtyard, surrounded by approximately 20 acres of woodland, lake and pasture, almost 8 hectares. It comprises two separate living accommodations with a single connecting door between. There is also a separate detached 200 year old farmhouse with original fireplace, for possible development into additional two bedroom accommodation. Reception/dining room with a floor area of 40m2, a large wood burner with feature fire surround and exposed beams. Bathroom provides toilet, bidet, hand basin and bath with shower. (Floor area 4m2). There is also a utility room (floor area 7m2) which provides a further access to the garden area and a separate toilet with washbasin. 300 litre electric water heater is situated in the utility room area. There is an additional conservatory room at the side of the house with a floor area of 18.6m2 that is accessed from the kitchen and gives access to the garden area adjacent to the house. Master bedroom with adjoining single bedroom/dressing room and a separate toilet/washbasin, total floor area of 40m2. There are four velux windows lighting this area. Reception/dining room with a floor area of 40m2, again with a large wood burner, exposed beams, wooden flooring and a wide walk through access to the kitchen. This half of the house has a toilet/shower room which is accessed from the lounge or the downstairs bedroom via a short corridor and has a velux window. The separate water heater for this part of the house is a horizontal 200 litre unit fitted above the ceiling in the corridor. The toilet/shower room has heated towel rail and electric fan heater fitted, it also has a plumbed in washing machine which will be included in the sale. On the first floor is a large bedroom (floor area 35m2) which can be adapted to a number of configurations. The recently constructed detached garage/workshop is in excellent condition with a floor area of 9x6m2. The garage has lighting and ample power supply and outlets. Main sliding doors and separate side access door are fitted. At the entrance to the property grounds is the original farm house which is structurally sound but would require renovation to make it habitable. It is currently used as a storage facility for the main house. Overall floor area of this building is approximately 90m2. There are three woodsheds situated at the rear of the main house which are used for wood storage to service the two wood burners in the main house. The existing wood cutting and splitting tools and a Countax lawn tractor will be included in the sale. There is also a polytunnel situated in the vegetable garden. The property is a single dwelling for tax and utility purposes and hence has one set of bills. To enable each half to establish usage charges, separate electric and water meters have been fitted to each half for usage reference purposes. Electrics have been updated, fosse conforms. 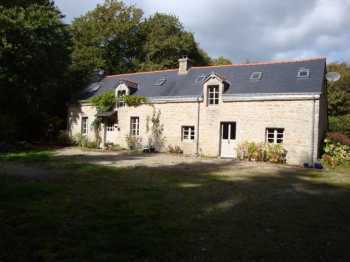 AHIB-2-DN-700 Guémené sur Scorff 56160 9 bedroomed neogothic mano rhouse with 13 acres! AHIB-DN-688 • Melrand, Morbihan, 2 Bedroomed Bungalow on a quarter acre plot. (Built 2008). AHIB-2-DN-618 Colpo 56390 Large village house to refit with 3/4 acre and a building plot! AHIB-2-DN-693 Nr Guémené sur Scorff 56160 Pretty lock up and leave home in heart of village. AHIB-2-DN-695 BAUD 56150 3 bedroomed farmhouse with pretty 2 acre garden, open fronted hangar/garage with a small workshop and a horse box. AHIB-2-DN-692 Nr. Pluvigner 56330 Superb sunny riverside property with 4-bedroom house, watermill and 30 acres.